PHILADELPHIA - Picture yourself at 19 years old. Maybe you were in college. Maybe you hit the job market early. What you likely weren't doing was guarding one the NBA's best centers in your first professional game. 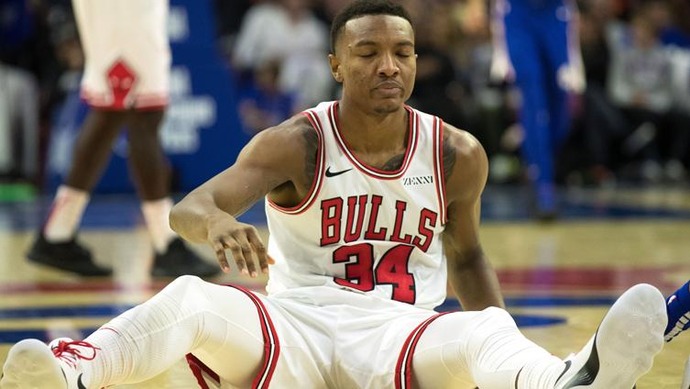 That was the task charged to Wendell Carter Jr. in the Bulls' 127-108 loss to the 76ers in the season opener at the Wells Fargo Center Thursday. Carter Jr. was the seventh overall pick in the NBA draft after just one season at Duke. He earned the start in his NBA debut after an impressive preseason, but nothing could've prepared him for going up against Philadelphia's Joel Embiid. "Oh yeah, for sure," Carter Jr. said when asked if Embiid was as impressive as he thought he'd be. "He's a phenomenal player. He's one of, or the best, big man in the league. Very skilled, very poised. He knows his spots on the court. "I didn't go out there with my best effort. It's just a learning experience for me." Carter Jr. had eight points, three rebounds, three assists and a block in 20 minutes. He also picked up four fouls, which the rookie attributed to the physicality and craftiness of Embiid. But he did flash the impressive and varied skill set that made him a high pick and such a coveted prospect. He was also able to garner the praise of the Bulls' veterans. "Even though Wendell got in foul trouble he was still playing (Embiid) solid," Zach LaVine, who scored a team-high 30 points, said. "That's a tough first game right there. But he didn't lack for confidence. Made him take some tough shots, but he's going to make them. He's that type of player." To his credit, Carter Jr. was candid about his performance. He admitted that his emotions ran the gamut from nervous to excited to happy. In a season that will have its ups and downs as the young Bulls develop and learn, there will likely be more games like this against other elite NBA competition. It'll be how Carter Jr. responds that will define his career. "It's the first game so I don't want to put too much on myself," Carter Jr. said. "It would be different if it was like the 50th game or 60th game. It's the first game. We're just going to move on from it. We've got our home opener on Saturday (vs. the Pistons). That's where my mind is right now."